It's been quite a while since I last wrote, I've been quite preoccupied, as I'm getting married soon. 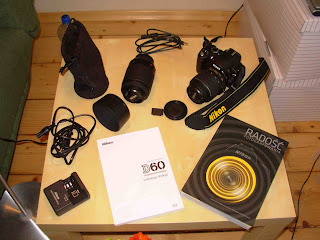 First order of business, I got a new camera! And wow is she a beauty. I took this picture with my Nikon L1 point and shoot. It is the 7692nd picture I've taken with that camera, and I don't regret owning it one bit. It served it's purpose well, and now it's being given to the in-laws. Back to modelling. 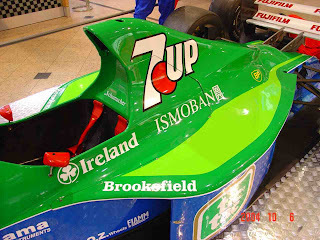 I want to build the Jordan 191 as it was raced by Michael Shumacher in the Belgian GP. I need aftermarket decals, as the Tamiya kit does not come with the decals needed to reproduce this car. I wanted this set: http://www.hiroboy.com/catalog/images/mc-d095.jpg, as I'm sure everyone does. It seems to be out of stock everywhere, including in Japan. 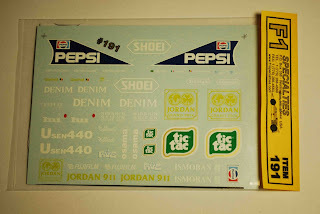 If anyone knows where I can buy these decals, please try to contact me somehow. Since I can't find these decals available anywhere, I looked at these: http://www.f1specialties.com/main/conversions/191.php as an alternative. I bought the F1 specialties decals from http://www.bestbalsakits.be/tamiya/home.asp. I am extremely satisfied with Best Balsa Kits out of Belgium. Communication was good, shipping was fast and safe. What more could you ask for? Well, I could as for F1 Specialties to make more accurate decals. I really hate to do this. I know people pour their heart and soul into a hobby like this, create some art, and if they are lucky, they are able to sell it. But the bottom line is Michael Schumacher is German and not Belgian. Here is the otherwise good decal set from F1 Specialties. Schumacher is German. There is no way around it. This is the German flag. This is the Belgian flag. This is the flag that appears next to Schumacher's name on the decal sheet from F1 Specialties. German Schumacher made his first appearance at the Belgian GP. 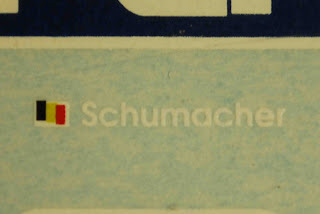 Flag next to Schumacher's name should be the German flag.